Margaret Gatonye conducted several farm visits together with the Rural Action team to understand and learn from the Amish growers. Margaret Gatonye, an African Studies master’s student from Kenya, has been working this semester as a Food Studies theme graduate intern with with Rural Action, a non-profit organization that aims at working together with local communities to revitalize Appalachian Ohio. With Dr. Theresa Moran, Food Studies Director, Gatonye is working to research and assist the OHIO Student Farm and local growers to meet minimum requirements for Good Agricultural Practices (GAP) certification to produce and sell to Culinary Services at Ohio University. Gatonye brings to her Food Studies internship the experience of having worked with international and local organizations on food safety in Kenya. In addition, she is working to develop a Good Manufacturing Practices (GMP) food safety document for the Chesterhill Produce Auction, run by Rural Action. Gatonye has also attended growers meeting and conducted several farm visits together with the Rural Action team to understand and learn from the Amish growers, as well as work toward meeting minimum requirement for GAP certification. On March 19, Gatonye, Moran, and Dr. Art Trese, Associate Professor of Environmental & Plant Biology who supervises the Student Farm, participated in the Produce Safety Alliance Growers Training on GAP certification, conducted by the Ohio Department of Agriculture, Division of Food Safety. 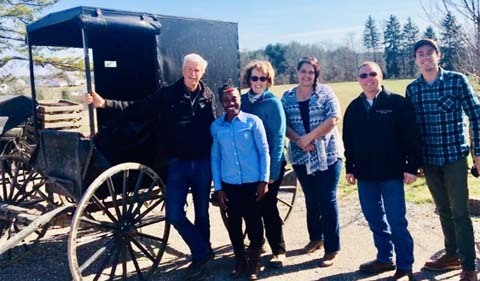 The day-long training, held in Chesterhill, gave the Ohio University team tools to minimize risk on the farm and produce safe food for human consumption. There were about 20 regional producers at the training session, including those from the Amish community. Gatonye relishes her work with community partners and looks forward to continuing to work with Rural Action to help local producers reach GAP certification and expand their markets to institutional purchasers.